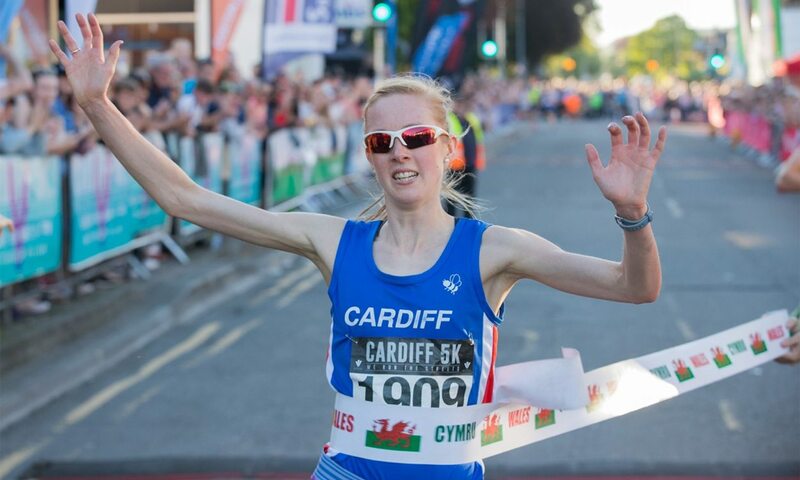 Charlotte Arter revised the Welsh all-comers’ record with a time of 15:40, while Jonathan Hopkins took men’s victory at the Welsh 5km Championships on Sunday, Alex Donald reports. The Cardiff 5k hosted the championships at their popular and well-supported road race that uses a flat and fast looping course. At the pre-race press conference the event’s three Team Wales representatives from the Commonwealth Games on the Gold Coast had pondered on who was likely to emerge as the 2018 champion. Tom Marshall of Cardiff AAC was defending the title but was aware that he would need to stick with club mate Ieuan Thomas and Swansea Harrier Hopkins if the sub-four-minute miler was to take advantage of his track speed. Thomas remained quietly confident as did Hopkins, who finished just ahead of him in seventh place in the Commonwealth Games steeplechase. When the action started to unfold, it was the three men that got away from the chasing field that included another Team Wales man, Iestyn Harrett, who had competed in the triathlon mixed relay. As the race looped near the finish line with around 8oom left to run, it was Hopkins who had stamped his authority on the race, with a lead of around 40m on chasers Marshall and Thomas. He stopped the clock in 14:18, just seven seconds outside of Kristian Jones’ all-comers’ record and 19 seconds clear of Thomas in second with 14:37. Abed Teweldebrhan claimed third for his Newport Harriers club, a week on from taking the third spot at the ABP Newport Wales 10k behind race winner Thomas. Marshall was next home in fourth, with the 2018 Welsh cross country champion James Hunt completing the top five in the championship but with Harrett splitting the pair in the open race. When Arter appeared on the finish straight, the crowds roared her on to the all-comers’ record which shaved 20 seconds off the previous mark that she had posted at the Nos Galan Road Races last December. She also came agonisingly close to the Welsh record of 15:39 set by Stevie Stockton at the Mid Cheshire 5k last weekend. ABP Newport Wales 10k champion Rachel Felton claimed second place in 16:48. Sian Edwards was third overall but second in the championship, with last year’s winner and previous course record-holder Alaw Beynon-Thomas taking bronze. Lachlan Oates and Annabel Simpson took the gold medals at the Scottish 5km Championships at Silverknowes, with both athletes celebrating doubles of sorts, Peter Jardine reports. Shettleston’s Oates followed up his 10,000m track win from a fortnight earlier, while Fife AC’s Simpson successfully defended the title she had won in 2017. Hunters Bog Trotters took the senior men’s golds, aided by Murray Strain in the week he was selected by GB for long distance hill running, and Edinburgh Uni Hare and Hounds repeated their women’s team win from a year earlier. But it was the overall depth of the race which once again commanded attention and delighted Cambuslang V55 athlete Peter Fleming, who remains high in the Scottish marathon and half-marathon rankings 35 years on from his pomp, winning the 1983 Glasgow Marathon in 2:17:46. “I can’t believe the depth in the race and how many people are running quick times,” said Fleming, who himself clocked 16:32 on the night to take a Run and Become V50 prize. Simpson led the way, with her 16:26 run her best on road or track, with Jenny Bannerman of Inverness taking the silver and Jo Williams of Lothian the bronze. There was an under-20 gold for Anna MacFadyen. The men’s race came down to a battle between Oates and Logan Rees, with EAC’s Michael Christoforou taking the bronze. With Tom Martyn fifth and Murray Strain in tenth, a 13th place for Jonathan Crickmore helped HBT wrap up the team win. 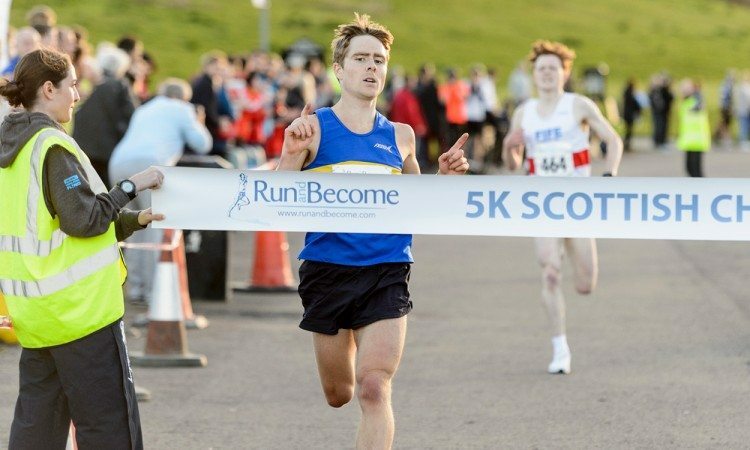 Jack Leitch of Edinburgh Uni Hare and Hounds won the under-20 title and Michael Carroll of Perth Road Runners the masters gold. Click here to watch drone footage of the event.